A couple of months ago, I converted my EP200Mmd monochromator into a scanning monochromator and tested the spectrums of quite a few light sources. This time, I will take take a look at the spectrums of three cheap eBay laser pointers using the same technique. 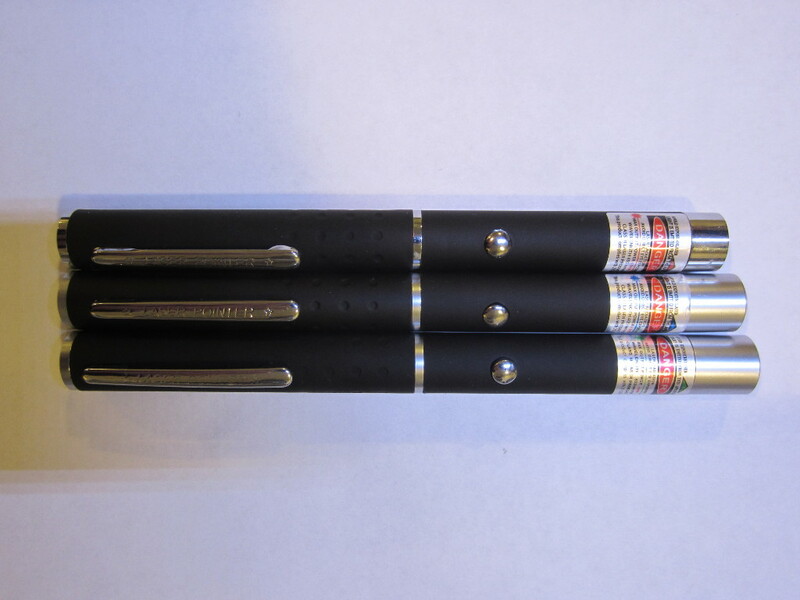 These red, green and violet laser pointers (see picture below) are quite popular on eBay. They can be had for less than ten dollars shipped. The ones I got are all rated for <5mW output power. The wavelength of the red laser is specified at 650nm ±10nm, the wavelength of the green laser is specified at 532nm ±10nm and the wavelength of the violet laser is specified at 405nm ±10nm. They each take two AAA batteries. As can be expected, the green laser appears extremely bright as its wavelength is near the peak sensitivity wavelength (555 nm) of our eyes. 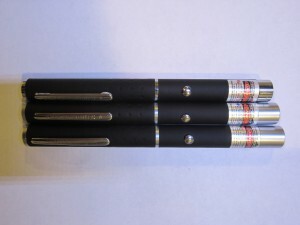 The red laser is pleasantly bright as you would expect from a typical laser pointer. The violet laser however, appears to be quite faint due to our eyes’ insensitivity to this spectrum range. But it can appear quite bright on a white sheet of paper and on some other surfaces due to fluorescence as can be seen in the captured spectrum later. I measured the operating current for these lasers using a 3V power supply. The red laser draws about 25 mA and as can be seen below, the measured spectrum sits around at 650nm. The laser beam was first diffused with a piece of paper before entering the input slit of the monochromator to ensure uniformity of the light. The current consumption of the green laser is around 320 mA, more than ten times the current consumption of the similarly rated red laser. This is because green laser is inherently less efficient as it is a DPSS laser. The green laser is also physically longer and heavier due to its extra complexity. One of the concerns many people have is that, because it is diode pumped the leaked-through 808nm and 1064nm infrared energy can be significant and without using a proper infrared filter, the energy levels at these wavelengths would be far more than the rated 5mW output of the green laser which would be extremely dangerous if looked at directly. Again, to measure the spectrum a piece of paper is used to diffuse the laser beam. 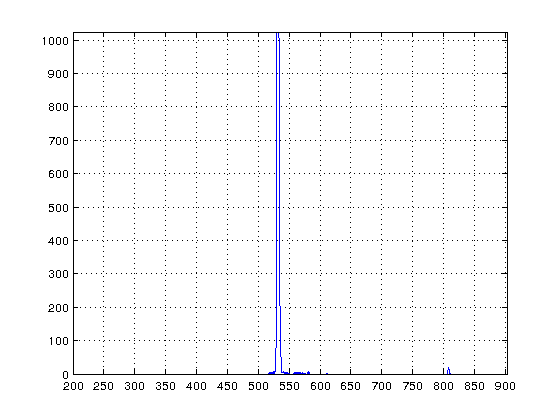 As you can see from the figure below, the spectrum line from the green laser sits at right around 532 nm as expected. 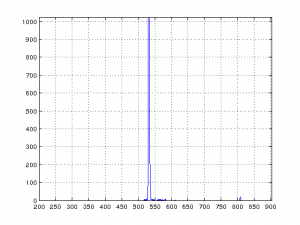 But if you examine the spectrum more closely, you will see there is another tiny peak near 800nm. 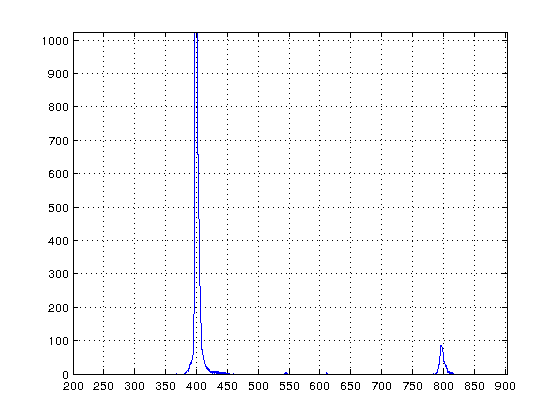 This peak would be the leaked-through spectrum of the main pumping infrared diode. Surprisingly, the energy peak is very minute. This is likely due to the fact that infrared is largely absorbed by the paper placed between the laser and the monochromator. Many reflective and transmissive materials in the visible light spectrum absorb or block infrared light. So only direct exposure to the unfiltered green light is potentially dangerous as the infrared component in the reflected or passed-through light is likely to be significantly attenuated as we observed here. 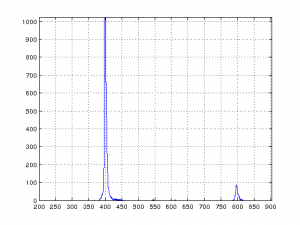 The violet laser draws around 190 mA during operation and the measured spectrum is shown below. 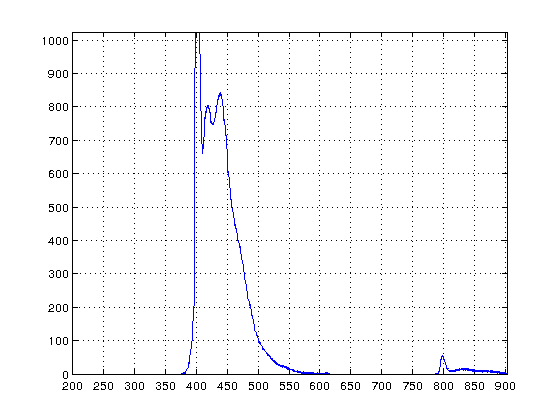 The peak spectrum is just above 400nm. What’s interesting is the peak at 800nm. There are two possible explanations for this second peak. The most likely explanation is that this is due to the ghosting effect of the diffraction grating used in the monochromator. The other less likely scenario is that the violet laser is also diode pumped, but diode pumped blue/violet lasers are much more expensive to produce so I doubt the one I have is a diode pumped. But again, the current draw is significantly higher than that of a red laser so I am not entirely sure on this. Since violet laser causes fluorescence in many materials, the violet laser was operated at a lower voltage and the beam was aimed directly at the collimator lens. If a piece of paper is placed in front of the violet laser, the laser dot on the paper will become bright blue due to fluorescence. The measured spectrum is shown below. The spread of the spectrum into the longer wavelength area is a clear indication of the fluorescence. 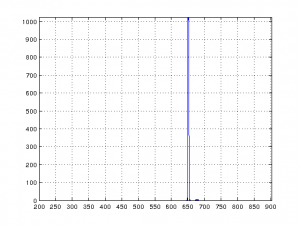 For a DPSS laser, the fundamental frequency (e.g. 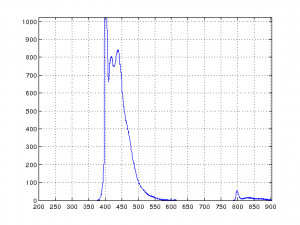 1064nm for a 532nm laser) should be vary sharp because of the rare-earth doped (Nd/Yb/Er/Pr…) materials. 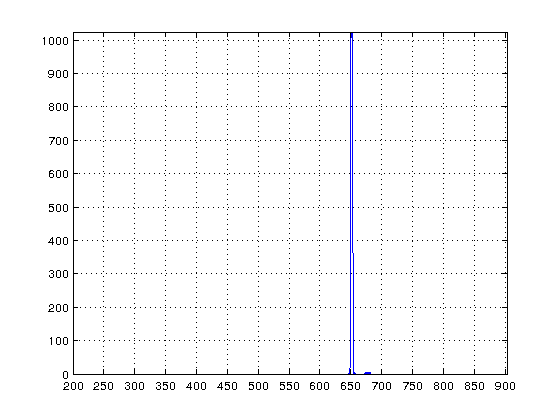 So according to the spectrum, the 400nm laser is not a DPSS laser.